What is sailing on the Zorg like? The horizon opens up as soon as you leave the main land, with the ship cutting through the waves, close to the water surface, and the sails billowing in the wind. The possibilities are endless. The Wadden Islands, historical harbourtown, or even the Friesian lakes; stranded on a sandbank or anchoring in a harbour; the wind decides. The Zorg met Vlijt is designed for speed. Light as a feather (for a ship of this length), with a low deck sheer, making it nimble, lithe and solid. The flat-bottomed ship is large and comfortable, but also surveyable. This gives our groups the feeling that they are not just part of the crew but also part of the boat itself. Amid the elements you will feel the surge of the waves and the power of the wind. Sandbanked with the Zorg met Vlijt. 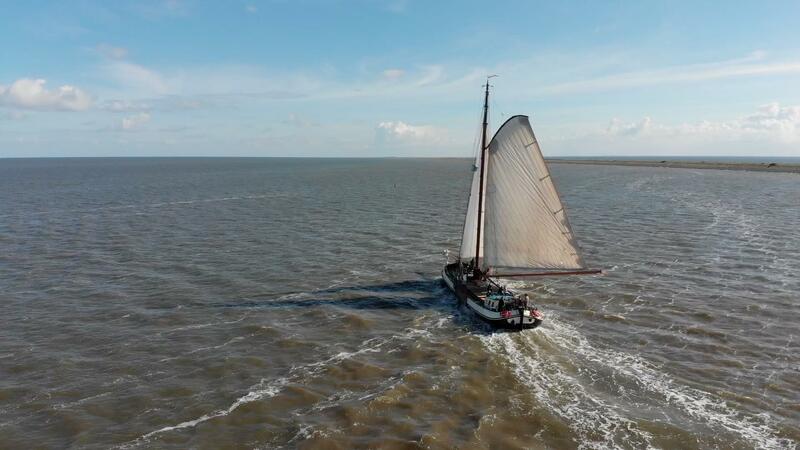 Sailing is, first and foremost, a teamsport and the Zorg met Vlijt will provide schooling for those who want to learn together. Reefing, slackening, gybing, luffing up, winching, mooring; you name it, we will teach you. Even those who feel less sturdy on their sea legs will enjoy themselves. There is enough space to sit back and relax, with the wind in your hair. Pure, sweet and salty happiness. When the sailing is over for that day, the passengers can enjoy life on board and experience old-fashioned Dutch coziness. Cooking and eating together, playing games below or stargazing upon the deck. Book now and enjoy this unique sailing opportunity with friends, family or colleagues.